The story goes back to 2015. After posting losses in both 2013 ($20.7 million) and 2014 ($65.7 million), CCP began making proactive moves to get their financial house in order. In March 2015, the company finalized a refinancing of its debt and delisted from the Icelandic NASDAQ in April. In October, CCP sold White Wolf Publishing to Paradox for cash. The big move occurred in November with the injection of $30 million by NEA and Novator Partners into CCP for investment into virtual reality. Other events that could facilitate a sale of CCP took place outside the public eye. The big investors, Novator Partners, General Catalyst, and New Enterprise Associates, took total control of the CCP board of directors. In May 2015, Isaac Kato, a co-founder of Verne Global, became a full member of the CCP board, replacing White Wolf Publishing co-founder Steve Wieck. Before Kato founded Verne Global, he was a principal at General Catalyst and his company received its original funding from both Novator Partners and General Catalyst. The second move involved new investor NEA general partner Harry Weller replacing Ragna Arnadottir. Ragna Arnadottir is the Deputy CEO of Landsvirkjun, the nationally-owned power company. With the additions of Kato and Weller, by the end of 2015 all of the board members had ties to one of the big three institutional investors in CCP. The composition of the board was not the only change. Who owned shares of CCP also changed dramatically. 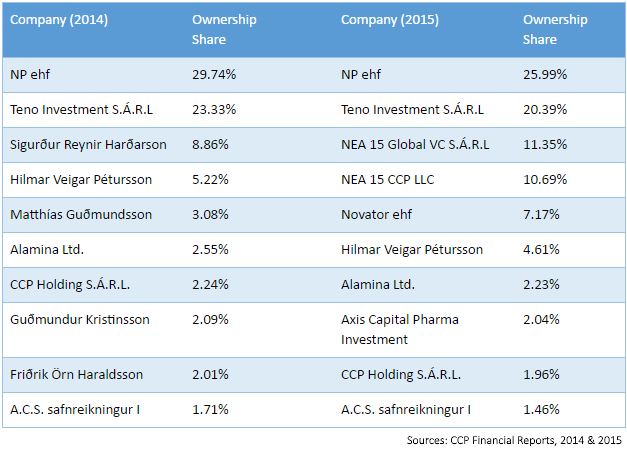 At the end of 2014, individuals comprised 5 of the top 10 shareholders of CCP, owning 21.26% of the company. The two biggest institutional investors, Novator Partners and General Catalyst (Teno Investment S.Á.R.L is a subsidiary of General Catalyst) owned a bare majority (53.07%). Those numbers changed drastically last year. 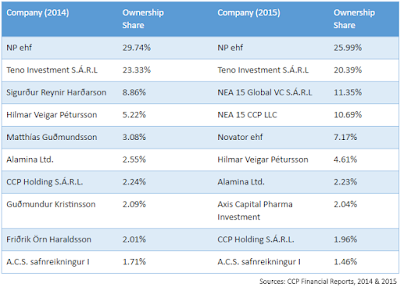 By the end of 2015, the big three investors (NP, General Catalyst, NEA) owned 75.59% of the company and only one individual, CCP CEO Hilmar Veigar Pétursson, showing up in the top 10 investors with 4.61%. Looking at the list, I was struck that both NP and NEA have two companies listed. I believe that is due to the nature of the stock each investor received for the cash injection. According to CCP's Consolidated Financial Statement for 2015, the two companies received a new class of preference share. I believe the two companies holding the new class of stock are NEA 15 Global VC S.Á.R.L and Novator ehf. The only loose end was NEA 15 CCP LLC. Where did that company fit into the picture if NEA's stock acquired through the equity transfer wound up in NEA 15 Global VC S.Á.R.L? I believe that NEA 15 Global VC S.Á.R.L received the new class of stock because it was only incorporated in Luxembourg on 29 October 2015, two weeks before the deal was announced. NEA 15 CCP LLC, on the other hand, is a Delaware corporation created on 15 June 2015. I'm not positive, but I believe the company was acquiring shares from individual investors even before the November deal. At this point, I came to the conclusion that the Bloomberg reporters received false information, at least about the valuation of CCP by the parties involved in the November deal. If 18.5% of CCP's total value is $30 million, then the company's total value at the time was approximately $162 million, not $300 million. As a special class of preferred stock, perhaps the stock is worth twice the value of other CCP stock in certain circumstances. But I doubt it. One question remained. Why the talk of a sale now? Is someone trying to take advantage of the increased player count in EVE Online following the launch of the freemium option to increase the value of CCP? The 900 million euro figure as a possible sale price seems outrageous otherwise. Another possibility is the death of NEA's Harry Weller on 19 November. Weller was the biggest venture capitalist in Washington D.C. and one of the best venture capitalists in the world. With Weller's death, and no one with a vested interest in continuing the investment, would NEA look to take a profit and run? I don't know if the plan was to hold the stock a year and then dump it, but the timing of the leak to Bloomberg less than 3 weeks after Weller's death looks like more than a coincidence. Also, I don't see anyone at CCP having contacts with Bloomberg. I'd look to NEA and General Catalyst for a leak like that. After a couple of days of digging around, I've come to the conclusion the talk of a sale is a trial balloon from an investor who sees a large profit sitting on the table and wants to cash out now. I can't rule out that a sale is possible, but I don't think one is as imminent as the Bloomberg piece implies. In my opinion, we need to wait until U.S. corporate tax law is settled next year before a major move is made on the CCP front. While Tencent is a serious possibility as a buyer, I have the feeling CCP's status as one of the big early studios involved with virtual reality will attract big money from a company in the West. That is, if the Bloomberg report is correct about someone willing to pay 900 million euros for CCP. I have my doubts about that.